Like many of life’s pleasures, or soul-defining moments, this beautiful book is deceptively simple — but it packs a powerful message. Unlike other books that aim for a “return to God,” as if one or the other of us has lost sight of the path, this book reminds us that God is all around us, right now — it is merely a question of remembering our connection. In fact, as the author, P. Raymond Stewart reminds us — We are God. We’ve come a long way since the 1980’s when Shirley McLaine went Out on a Limb on national TV to say the words out loud, “I am God.” And even she had trouble saying that. Since then many others in the vanguard of spiritual questing have been bringing back the same message from the frontlines: we are energy, we are creators, we are responsible for what happens in our lives, we are healers, we are capable of miracles — in short, we are gods. Stewart makes the case wonderfully that we are finally ready to embrace this message on a collective level, indeed that we have manifested this book because we are ready for the next evolutionary leap in consciousness. But first comes remembering — healing the separation … The author goes point by point through the various perceptions, beliefs and attitudes that we may have to get beyond in order to heal. This may involve shedding old cultural notions of God as judge, or as a “source of doling out good things.“ Or, it may require owning the dark impulses, the “shadow” side of humanity. It almost certainly involves some death of the ego. In this, the author shows humor, humility, and a deft hand, reminiscent of Jon Kabat-Zinn in Wherever You Go There You Are, at highlighting the sheer silliness of our egos and how tightly we cling to our self-aggrandizing beliefs. However, Stewart believes that we are ready for this letting go, that enough people desire this transformation now, so that we have reached a tipping point in the collective conscious where we can return to an acceptance of our true nature. The most beautiful and moving parts of this book are when the author is reminding us of the ineffable nature of God and his belief that when this Source wants to know itself better, it does so through us. Ergo, God is present as us and to know ourselves is to know God. Stewart calls for a return to the feeling of God, a felt realization that may begin by saying the words,”I am God.” Or it may begin, as the author suggests, by feeling God as a single field of consciousness with many points of experience, meaning each one of us. He’s right that it’s a great way to deflate the ego — it’s difficult to feel either superior or inferior to anyone else if we are all rays off that one great sun. If all this sounds too deep or too complex — this is where the “deceptively simple” part comes in. Stewart has managed to put all this, and more, in a book that is as readable as a child’s bedtime story. Living As God has a rhythm and pace to it that flows like a clear stream. In fact, it would be easy to sail through this book in one quick read — but that would be a mistake. The author makes as much use of pauses and blank space as he does of actual words, and that is the reader’s cue to take one’s time to savor the message — feel it, as the author would say. Read a few pages and mull on it, or take a walk around the block — this book rewards as handsomely the time taken to pause as the time taken to read. If P. Raymond Stewart is correct that we, as a collective, have manifested this book — (and the author feels strongly enough about this point that he says that his name is a pseudonym, because it doesn’t matter who the author is) — then it is tempting to ask “Why?” or “Why now?” The answer may be that we are finally ready to take responsibility for our energy, our intention, and what exactly we are doing with it. As the author says, if we want to make the changes that we desire in this world, then we need to remember our connection and our responsibility. On the one hand, if we are God then there is no blaming anyone else for the world that we are manifesting right now, and that may seem grim, or daunting. On the other hand, if we are truly at a tipping point, at a time of transformation, then faith and hope become stronger that we can create the world differently. Living As God — Healing the Separation makes it that simple, and that powerful. 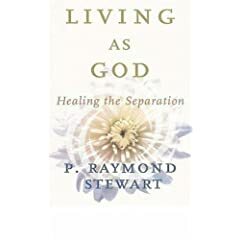 The spiritual guide and author that uses the pseudonym P. Raymond Stewart has been quietly bringing light to this world in his own way for many years. He experienced a profound awakening and transformation while traveling alone through the US when he was 18 years old. Realizing the essential oneness of all life, he returned home, gave away all that he owned and lived contentedly as a hermit for some years as he integrated this new sense of Self and reality. His life changed once again when he met his future wife. The writings that eventually became the book Living As God emerged as he began sharing this ever deepening sense of unity with those around him. He is available for lectures, meditations, workshops, retreats, and personal counseling sessions internationally.